Home / What Is The Best Fillet Knife For 2018? What Is The Best Fillet Knife For 2018? 1 What is a fillet knife? 2 How to choose the right fillet knife? 4.1 Can a fillet knife be used for deboning? 4.2 Is a fillet knife used only for fish? 4.3 Should I get an electric fillet knife or a traditional one? 4.4 Can I use a regular kitchen knife for filleting purposes? 4.5 Which brand is the best? 4.6 What is the difference between a fillet knife and a boning knife? 4.7 How much does a fillet knife cost? Having the right tool for the job is essential in getting the job done quickly and effectively. This is true in all situations you may find yourself in. When it comes to filleting, having the best filleting knife at your disposal is the sure way to making the filleting tasks easier, quicker and also safer to perform than if you would be using a standard kitchen knife. Choosing the best filleting knife can be a bit daunting task as there are many models to choose from, and special requirements may be placed on the knife depending on what you need the knife for. Filleting knives for fish will require slightly different features than a knife for meat filleting. To make the task easier for you, we created this small website featuring fillet knife reviews which will guide you in buying the top knife for your needs. If you are in a hurry, you can check the best fish fillet knife comparison table below this paragraph to quickly scan through some of the top rated fillet knives currently available on the market. More detailed reviews are featured below the table and also on other subpages so be sure to check them out. Fillet knives are essentially knives, which are used for removing skin and bones from meat. Most commonly, they are used for deboning and skinning of fish. They can however be used for any other types of meat. The similarities to boning knives confuse many people. Most of the fillet knives have straight blades. On the opposite side, the boning knives tend to have their blades curved upwards, although it’s not necessary. What is really typical for the filleting blades is the flexibility. While other knives can be flexible as well, the filleting ones are often equipped with the most flexible blades. They are also usually much thinner than other knives. The thinness, flexibility, and shape of the blade make it much easier to cut fillets out of the fish, allowing for better precision and maneuverability. How to choose the right fillet knife? There are several factors, which should be considered when shopping for the right model. We’ve summed some of the most important factors in the bullet points on the next couple of rows. Blade size – Filleting knives come in various sizes. Typically, you’d want to consider what kind of fish you are going to fillet most of the time. Larger fish will require a longer blade. As rule of thumb, a 6 or 7 inch blade will be suitable in most cases. So if you are unsure, get yourself such blade. Blade material – Don’t cheap out on the blade material. High quality stainless steel blade will survive many years of use, if you take good care of it. Some of the manufacturers prefer to use non-stainless steel because it can be made much sharper and durable. Handle – Cutting yourself while cleaning the fish is a sure way to make the day go from great to not so great. Having a handle that sits nicely in the palm and doesn’t slip off when dealing with the wet and slippery fish skin and meat is essential. Most of the time, the handle will have some kind of rubberized surface to prevent slippage. Flexibility – It’s important for the blade to be flexible. The longer the blade, the less flexible it usually is. However, fillet knives should never have completely rigid blades. Cleaning with such blade would be nearly impossible. There are many companies that make high quality blades you could go for. 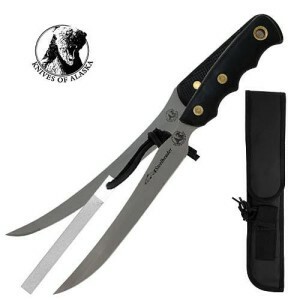 To mention a few of them, we would go for Dexter-Russell, Leech Lake Knives or Buck Knives models without hesitation. Now let’s take a look at some of the best rated filleting knives on the market. The have been chosen based on our experience, customer ratings, other media reviews and lastly also on the price. We prefer our knives to have good price-performance ratio. It’s not necessary to shell out hundreds for a knife if you can get another model for half its price, which performs similarly. Although the list is numbered, the knives are not in a particular order. Wusthof is one of the most popular knife making companies. This is a member of the Wusthof Classic line that is known for high quality. When you will receive the knife, it will be extremely sharp and it may be wise to use protective gloves when cleaning the fish. The super sharp forged blade is made of high quality high carbon steel with protective stain-resistant alloy. It’s very flexible and therefore suitable even for the most delicate fish. The three-riveted handle is made of synthetic and sits nicely in the hand. With its usual price, the knife is not cheap by any means, but it’s built to last for decades with proper care. The product is backed by lifetime warranty from the manufacturer. As a bonus, the knife ships with a nice leather sheath. The Baracuta is a knife that divides fishermen into two groups. One of them loves the flexibility and utility of the replaceable blades, and the other one stands firmly behind the classic fillet knives. Putting these standpoints aside, it’s safe to say that the Havalon Baracuta is a high quality filleting tool that makes cleaning a breeze. 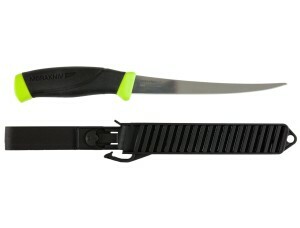 The knife comes in various sizes, with the one in the picture being the 5-inch model, which would be suitable for smaller fish. 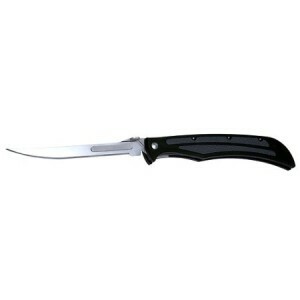 This knife is equipped with replaceable blades, which are simply thrown away when they get dull. Don’t worry though; it holds edge for quite some time. We see as great convenience – if the edge gets dulls during cleaning, you can simply replace the blade and continue as if nothing happened. On the other hand, if you’d had only one standard knife, you’d need to sharpen it to continue. The replaceable blades are also quite cheap, especially when bought in packs. This has to be one of the best looking filleting knives out there. The handle is made of elk or deer antler and looks really gorgeous. The blade is made of high quality D2 steel, which uses air hardening, and contains high carbon and chromium. Chromium contents provide the blade high corrosion resistance. Many of the best custom knife makers use the D2 steel for their knives. It’s much easier to sharpen this kind of steel than regular stainless steel. With its 8 inches of blade’s length, it is best used with larger fish. As opposed to some of the other models, this one features a slightly less flexible blade. So if you are looking for flexible blades, this might not be the best choice. The knife ships with custom leather sheath and is backed by limited lifetime warranty by the manufacturer. Knives of Alaska is another extremely popular outdoor knife makers. Their products often sport unique designs and are usually well made. The filleting combo in question is not an exception. On the contrary, it belongs to the best-rated filleting knives on Amazon. The original manufacturer’s description somehow failed to mention critical information – the blade’s length. Fortunately, we found out that the Coho is 8 and half inches long and the steelheader is 6 inches long. Given the sizes, this combo is a good choice for those who need two differently sized tools for fish cleaning. The blades are made of high quality 440C steel and are very flexible. Due to the steel’s hardness, it is slightly more difficult to sharpen the blades, however, the will hold edge for long time. A plastic sheath will be packed together with knives, and the manufacturer also throws in a diamond coated sharpening steel to keep your new tools in the best possible shape. Update: This knife is currently unvailable. Victorinox is a Swiss company known for crafting some of the best army knives. If you love their army knives, you will certainly love their fillet products as well. This one has 8-inch long straight blade, which is flexible and provides great maneuverability and precision when cleaning fish. We couldn’t find what the blade is made of, however we can presume it’s stainless steel, because the manufacturer states that the knife is dishwasher safe. This knife has an ergonomic fibrox handle made to be slip resistant. Thanks to the highest standards, the knife has earned the NSF (National Sanitary Foundation) seal of approval. Unlike some of the other best-rated models, this one doesn’t cost a fortune. Helle Hellefisk is a gorgeous looking knife with custom handmade handle made of cork with a small finger grip. The blade is made of Stainless Sandvik 12c27 steel that gives it great durability and allows the edge to stay sharp for long time. Helle doesn’t necessarily produce top of the line products, however they offer amazing quality – simplicity ratio. Some people may not like the simplistic design of their models, but they serve their purpose without a sweat. 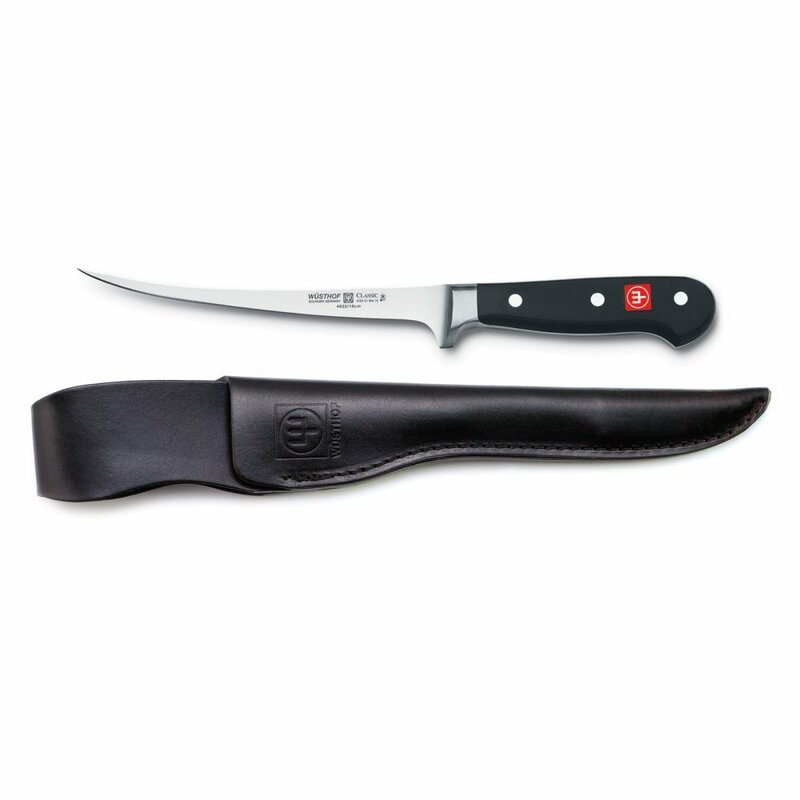 With 4.8-inch blade, the filleting knife is slightly shorter than the other products we’ve mentioned. Therefore it’s more suitable for smaller fish. It also comes with a full grain leather sheath, which protects the blade nicely. This is the knife to go for if you wish to have a modern looking and well-made model for your fishing needs. It has a progressively tapered blade and a mirror style polished finish. The blade is made of high quality European stainless steel that can be sharpened to the best sharpness possible and it will hold edge almost forever. It is also slim and very flexible making it an ideal choice when precision cuts are needed. 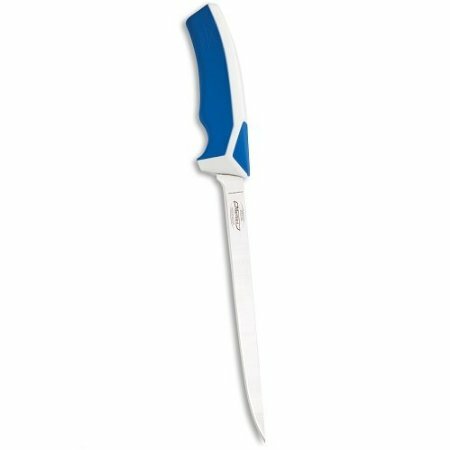 This knife has an ergonomically designed blue-white handle made of synthetic. It assures a comfortable and non-slippery grip. When it comes to customer fillet knife reviews, this one has one of the highest scores on the Net. This is a knife, which comes fitted with a 6.1-inch blade made of stainless steel. It is thin and flexible allowing the fisherman to perform precise cuts even when preparing the most delicate fish. It also comes fitted with a durable high-friction handle. The handle is patterned in such way that it reduces slippage. Together with the knife, a plastic sheath will be shipped. It is easy to clean and features interchangeable belt clips. 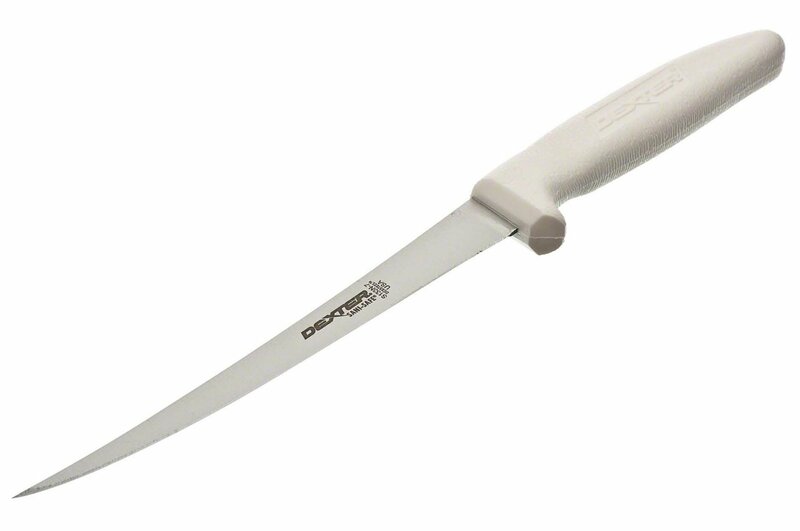 This simply is a great choice for anyone who would like to have a quality filleting knife for an affordable price. This has to be one of the most popular filleters on the market. The Rapala4 knife comes in various sizes ranging from 4-inch to 9-inch blades. The longer the blade, the higher the price is. However, the price is still so low even for the 9-inch model, that it doesn’t really matter that much. The knives are equipped with very flexible stainless steel blades. Some of the customers mentioned that the knife ships not as sharp as it should be, but couple of runs over a knife sharpener will deal with that. With the soft grip no-slip handle, you can be sure the knife will give you maximum control and flexibility. It ships with a black sheath and a single stage sharpener, which can be used out in the fields when you need to sharpen the edge. Together with the Dexter-Russell knives, this has to be one of the best cheap filleting knives available. Dexter-Russell is an American company well known for making quality cutlery. Their Sani-Safe series of filleting knives is popular among many fishermen and chefs and rightly so. This knife is fitted with a 7-inch straight edge blade made of steel with a pointed blade tip. It is narrow and very flexible. Many professionals use the Dexter-Russell knives for their sharpness and ability to keep the edge. Deboning with their knives is quick and easy. It is equipped with white plastic ergonomic handle, which may not look fancy, but it serves its purpose. With that being said, the knife is also very lightweight which makes it a breeze to clean fish with. Can a fillet knife be used for deboning? Yes, of course, most of the filleting knives can also be used for deboning chicken, pork or other meats. Some of them though are not designed for such tasks and it may be ineffective to use them. For example, some of the filleting models have pointed blade tips, which are not as good as curved tips when it comes to boning. Is a fillet knife used only for fish? No, fillet knives can be used for any meat. You can even use it for cutting and slicing vegetables if you wish. They are however most commonly used for cleaning fish because of their thin, narrow, and flexible blades, which are all attribute that make it much easier and faster than with a traditional chef’s or boning knives. Should I get an electric fillet knife or a traditional one? We are afraid, that no one can answer that question for you. You will have try it yourself. Electric knives can make the whole fish cleaning process slightly faster. On the other hand you have carry batteries with you and it’s not as easy to clean an electric knife. If you’d like to learn more about electric fish fillet knives, you can check out our article dedicated to them. Can I use a regular kitchen knife for filleting purposes? Well, you certainly can, but it won’t be ideal. You will miss the flexibility of the blade, and will most likely end up with a messed up fillet. Fillet knives are not expensive; we highly recommend getting the right tool for your filleting adventures. That’s a difficult question. There are many manufacturers who make high quality knives. What is the difference between a fillet knife and a boning knife? Boning knives tend to have stiffer, shorter blades. They are most often used for deboning poultry, pork or beef. Whereas filleting knives are usually longer with blades that have much higher bend to them. They are designed to slice through the fish along the backbone and under the skin. How much does a fillet knife cost? 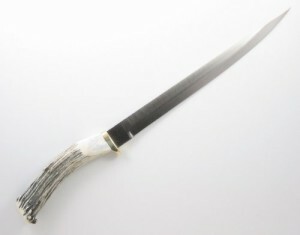 That depends on many factors such as the brand, materials used for the blade and the handle, size of the blade, or whether a sheath is included. You can get them for as low as 10 bucks or go for some of the top of the line models, which will set you back by hundreds of dollars. Especially, if you’d opt to go for a custom made knife. Higher price does not mean higher quality, so choose wisely.